Websites and Passwords is a password storage program that will relieve you of the password management chore while offering you complete security and peace of mind. Your precious information is stored as encrypted data that only you can access. Websites and Passwords keeps your passwords, logins, credit card numbers and any other confidential information in a very securely encrypted form but this information is always immediately available to you. * Passwords for files (For example Excel and Word files). * Web forms auto fill feature. * Install the program to a Removable Device such as a USB memory stick. * Quick access to accounts via bookmarks. * Removing files completely and permanently, this is called "wiping". * Customizable automatic data backup features. * Encryption of data files with the 256-bit Advanced Encryption Standard (AES) algorithm. 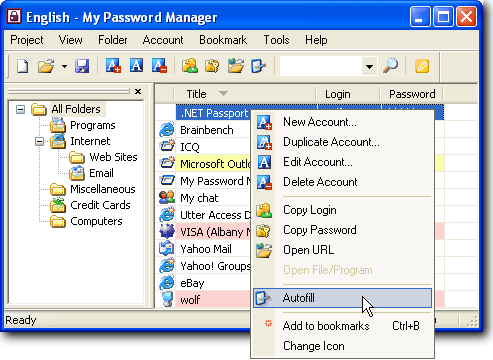 * Websites and Passwords has a built-in customizable password generator. * Convenient data search features for when you store large amounts of data. * Feature to import data from a file. * Feature to export data to a file, export to password-protected HTML page. Qweas is providing links to Websites and Passwords 2.1 as a courtesy, and makes no representations regarding Websites and Passwords or any other applications or any information related thereto. Any questions, complaints or claims regarding this application Websites and Passwords 2.1 must be directed to the appropriate software vendor. You may click the publisher link of Websites and Passwords on the top of this page to get more details about the vendor.